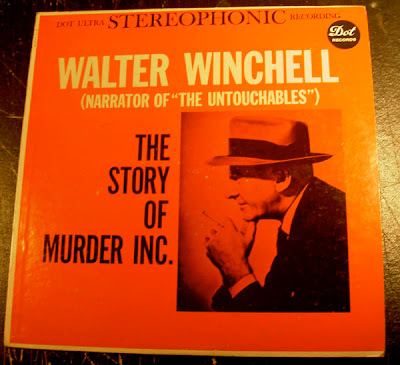 SIX FOR FIVE: Walter Winchell and Murder Inc.
Walter Winchell and Murder Inc. Here's a little treat from the vinyl vaults...! Walter Winchell had a huge impact on early 20th century journalism with his ability to translate the tempo and staccato rhythm of 1920s New York into the printed word, and then translating that talent onto radio. He was the 'King of the Scoop', his reports colorful and more than likely exaggerated, reaching over 89 % of the American public through his columns and radio show. Winchell broadcasted his actual involvement in the surrender and capture Louis 'Lepke' Buchalter to the FBI's J. Edgar Hoover in 1939. Some of Lepke's henchmen contacted Winchell personally in order to co-ordinate the hand over to Hoover, whom he knew personally. Winchell could smell a great scoop a mile away, and agreed to play the middleman, solidifying his huge cultural influence at the time over the general public. amazing. this is such fantastic find. thanks for posting it.